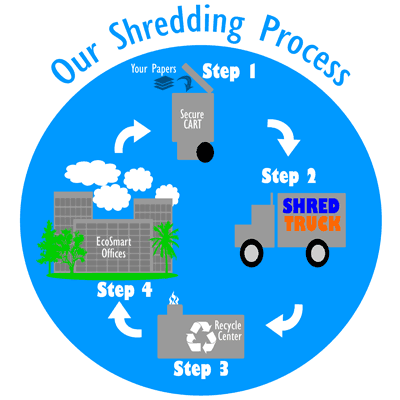 We shred for businesses and residential customers. We are secure and 100% compliant with all state and federal privacy laws. Even if you have a simple question we would love to hear from you. We will will not waste your time with a cheesy sales pitch or try to scare you into choosing Shred Bull®. We will be upfront and honest. 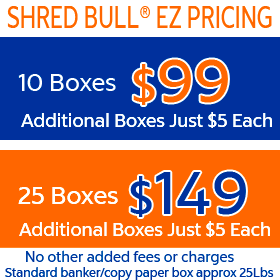 Shred Bull® will do a great job for you. We are in this for the long run and work hard to earn your repeat business. Shred Bull uses industry “best business practices” to certify and authenticate that your materials have been properly destroyed. The first step is for one of our professionals to gather up all the paper to be shredded and put into one of our secured shredding carts. Once all the paper is in the cart we wheel the cart to our 100% HIPAA compliant shredding truck. The cart is then lifted onto the truck where all the confidential paper is fed into our giant, 6,000 pound mobile shredding unit. The truck can shred about 100 boxes per hour(10 full carts). We shred all the material onsite. The truck then goes to the recycling plant where all of the shredded paper is recycled. The recycled paper is used for consumer paper products. This keeps the paper out of the local landfill and makes the earth a better place to live. You should anything that has a signature, account number, social security number, or medical or legal information (plus credit offers). We recycle all paper we collect. Sorry, but we cannot accept bound books, cardboard, magazines, newspaper or soiled paper, most of your municipal garbage companies will accept those items as part of their curbside recycling programs. We can shred paper with staples, rubber bands and paper clips. All other metal will need to be removed as it creates a fire risk (paper dust on the truck + spark from metal = possible fire) We can’t accept x-rays but they can be separated from the paper and then recycled(there are many free services that want your x rays since x rays contain silver. The main thing we shred is paper. Need visual proof that your documents have in fact been destroyed? 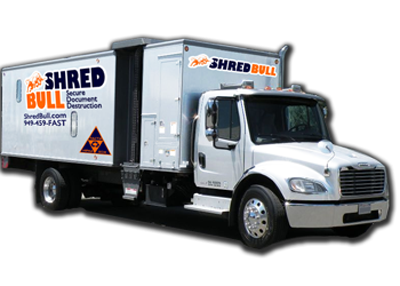 Shred Bull’s residential & business shredding services uses a specifically manufactured truck with windows that allow you to see the shredder at work! We use the hammermill pulverizing paper shredding system. Shred Bull’s hammermill makes it impossible to miss a single page during the shredding process. The shredder on board the truck actually uses brute power to pound paper through a mesh filter, resulting in random tears, none larger than 5/8”. Shred Bull provides businesses and individuals with a professional secure shredding service and recycle 100% of the shredded material. Shred Bull’s mobile shredding service will shred documents at your business’ location. Customers can start by using Shred Bull’s “one-time” purge, or as a regularly scheduled client. Mobile shredding – Shredding trucks come to your business and destroy your confidential materials on site. You watch the shredding. Route Shredding Service – Daily, weekly, or monthly scheduled shredding service is available. Secure, locking shred bins are provided for free. Purge Shredding Service – For those requiring annual, one-time or occasional shredding service. Pricing is based on the volume of paper shredded. Secure Shredding – All shredding services used are secure and compliant with Federal and California privacy laws. Certified Document Destruction Service – No matter the paper is shredded, you get a Certificate of Destruction. We look forward to helping you. Please reach out to us if you have any questions. We service accounts in the field Monday-Friday 7:00AM- 7:00PM and are open Saturdays & Sunday by appointment.